I always enjoy travelling up to Edinburgh in the bonnie month of August for the Edinburgh International Festival. There is so much going on, there are so many shows to see, dance acts to watch, comedians to listen to, as well as an abundance of street performers. The city is heaving with excitement and drama. I love it. So with that in mind I thought I would do a sequence of posts to get you in the mood for the forthcoming Festival, here is my first of these featuring my photographs of Deacons House Café, which is a short walk from The Festival Fringe Box office. The guy below isn’t one of the merry troupe of actors taking part, he is guarding Brodie’s Close. This is most definitely a spot to stop by. 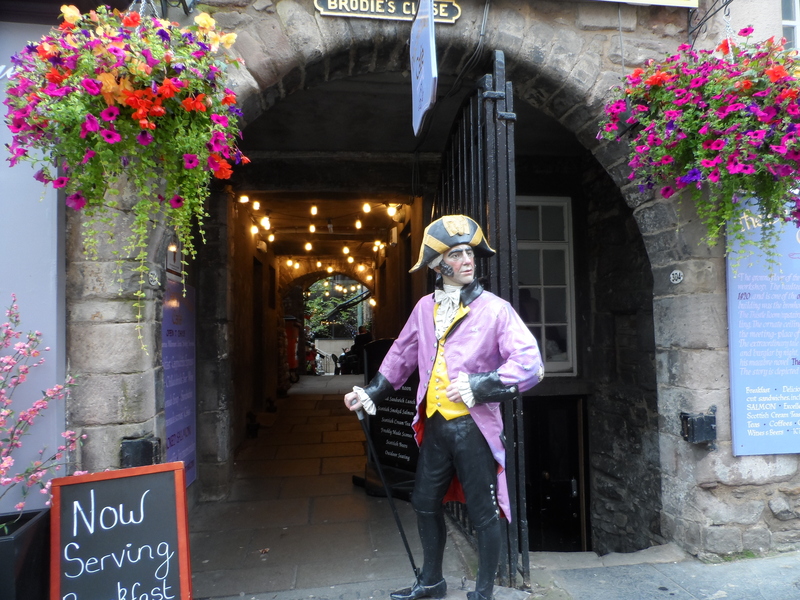 Deacon Brodie was a respected cabinetmaker by day, but he was also a thief by night, and he and his friend and co-crook Smith were hanged at the Tolbooth Prison in the High Street on 1 October 1788, before a crowd of 40,000. I stumbled upon this quaint coffee house, Deacon House café, 3 Brodie’s Close, 304 Lawnmarket, Royal Mile, Edinburgh on my way to pick up tickets for some Festival shows. 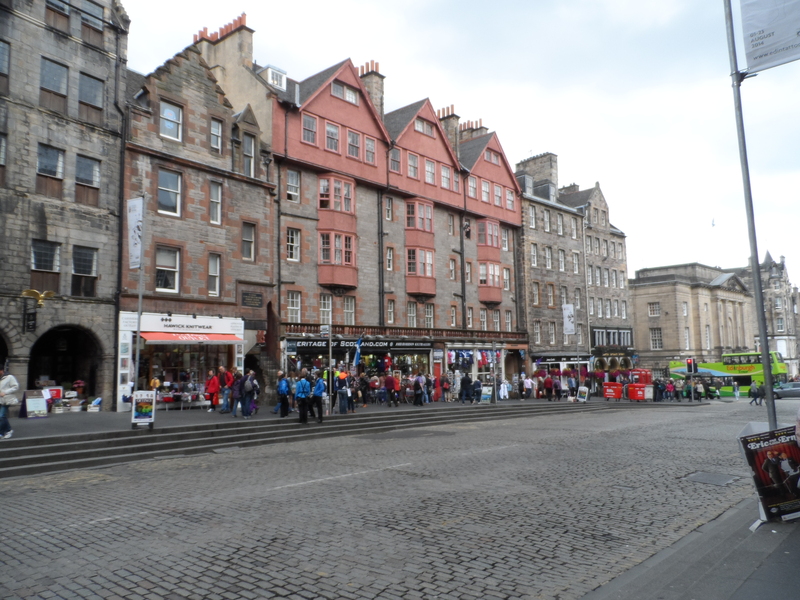 It is in the very hub of Festival land within short walking distance of Edinburgh Castle, Waverley Station and George IV Bridge. 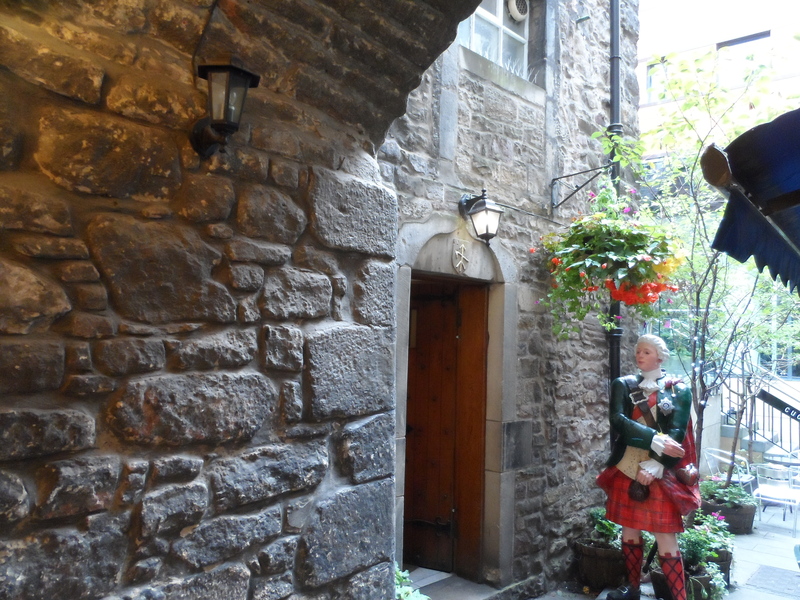 The photo below is a bit blurry, so here’s what the plaque says: The ground floor of the café was once Deacon Brodie’s workshop. 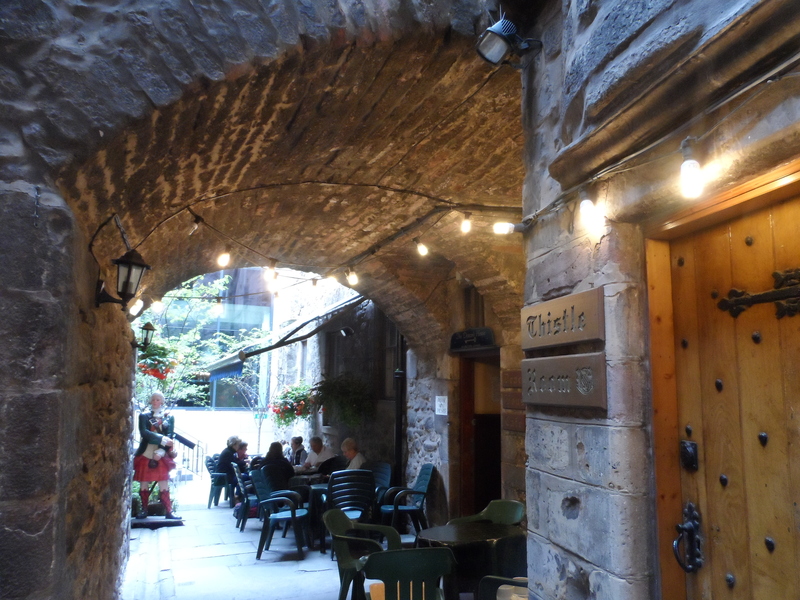 The vaulted ceiling in the kitchen dates back to 1420, and is one of the oldest ceilings in Edinburgh. This part of the building was the brew house for the Abbey which occupied this site. The Thistle Room upstairs was part of Deacon Brodie’s dwelling. The ornate ceiling dates from 1645. The room is still the meeting place of the Celtic Masonic Lodge. The extraordinary tale of Deacon Brodie, upright citizen by day, and burglar by night inspired Robert Louis Stevenson to write his macabre novel The Strange Case of Doctor Jekyll and Mr Hyde. The story is depicted in our mural inside. As you can see they serve a wide variety of yummy food, this is a real gem of a find, well worth a visit, so don’t forget to stop by on your way to buy your tickets for shows! Opposite the café, if you fancy anything a bit stronger, you can pop into Deacon Brodie’s Tavern, where they sell real ales. 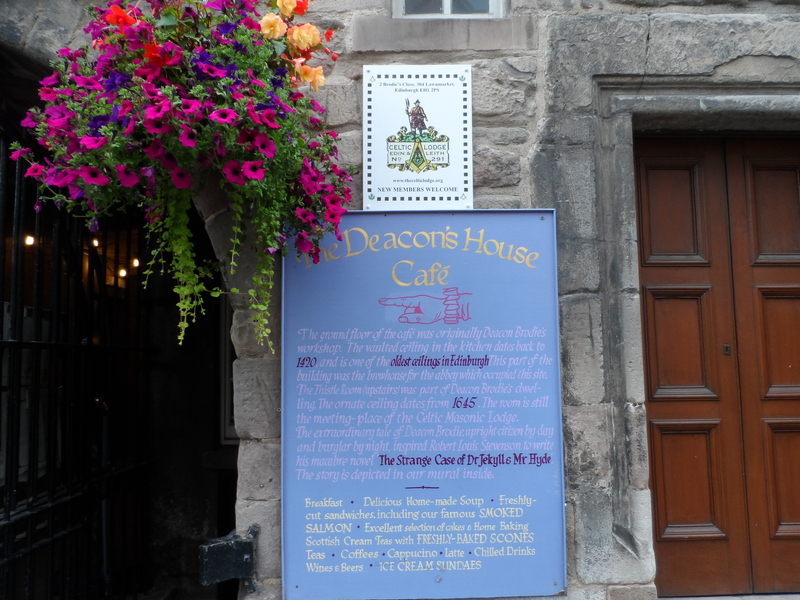 The Deacon Brodie Tavern is featured in Nicolson pubs of distinction, see the links below. I’ll be doing some more on the Festival soon. I hope this little feature on Deacons House café got you in the mood for exploring what Edinburgh has to offer this year, it certainly made me hungry for more….. 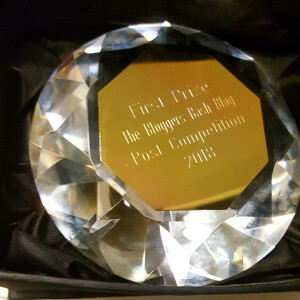 This entry was posted in Edinburgh Festival and tagged Deacon Brodie, Deacon Brodie Tavern, Deacons House Cafe, Drama, Edinburgh Fringe, Edinburgh International Festival. Bookmark the permalink.